This exclusive mobile phone kit includes all the accessories you need to take better photos. You can easily insert your iPhone or Android Phone into the clamp and use the tripod for steady shots. Or, simply swivel the legs to turn it into a phone grip for on-the-go shots. Add the fisheye lens for a different view of the world - it gives a fun curved effect to your photos which can lead the viewer into your subject. The wide angle lense is great to get all your friends in that perfect selfie shot! Kids will have fun using the macro lens to take close up photos of bugs and explore their world. It makes a great gift with the nice gift box, carrying case and exclusive downloadable ebook with fun photo activities. Instagram, Facebook and Pinterest photos! 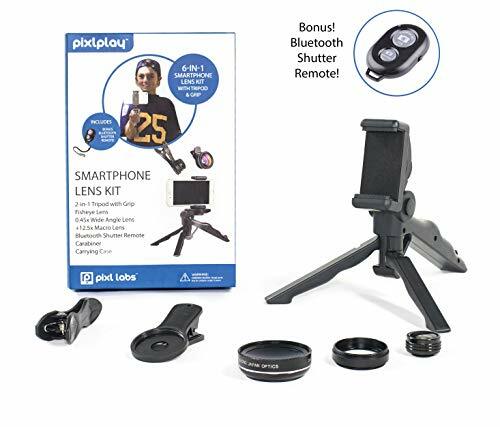 Have fun taking group shots or selfies with the wireless bluetooth remote for your phone camera and unique 2-in-1 tripod / grip to ensure steady shots. The best quality lens 3 x multi-coated lenses (fisheye + wide angle - macro lens) will help you take some very unique photos and videos. Great for instagram, facebook or making movies! Exclusive configuration includes gift box and zipper case with large carabiner and foam tray for all the accessories! A great gift for kids and families with ebook including photography activities. If you have any questions about this product by Pixlplay, contact us by completing and submitting the form below. If you are looking for a specif part number, please include it with your message.